Recently SheIn sent me a couple new items and I received them on a Friday. 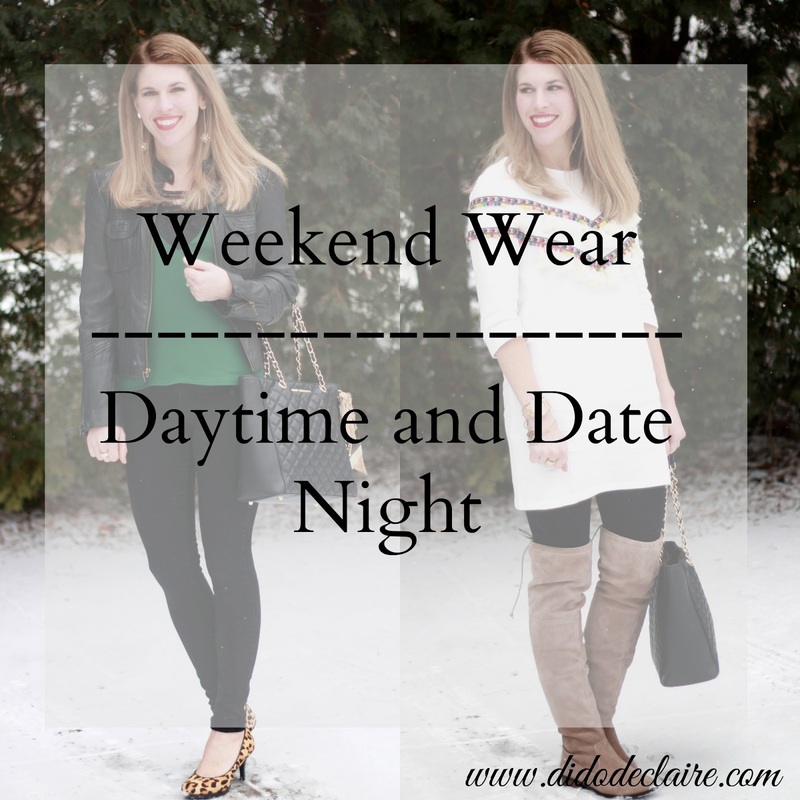 After seeing the items in person, I was struck by how perfect they would be for the weekend! The pom pom tunic I received was a great casual piece and very comfortable for running errands during the day Saturday. I love the length because I could pair it with leggings and boots to stay warm and cozy all day. 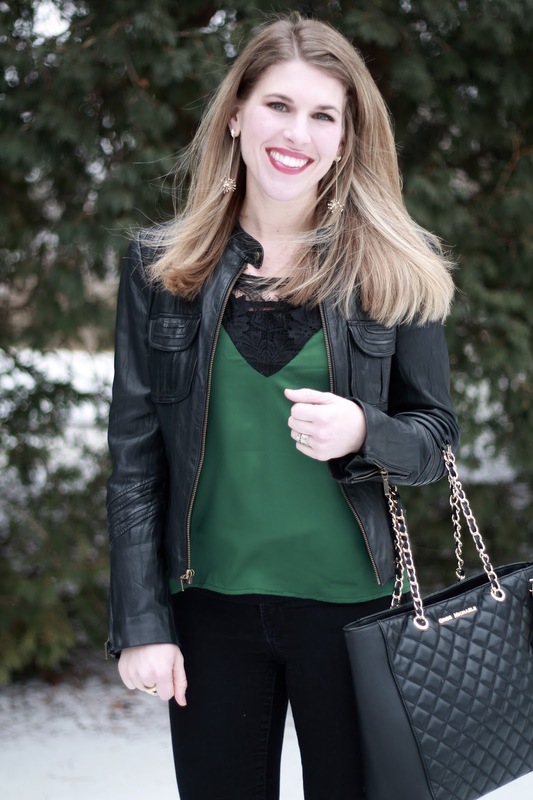 The lace camisole I received was great for date night! I paired it with a leather jacket and black jeans for an edgy look. The lace and detail around the neckline really makes it a standout piece! The best part is that combined, both items are under $40! If my tunic looks a bit different than the website, it's because I didn't really care for the tassels on my arms so I snipped those off. They made my arms and shoulders look bigger and I just thought it was too much. But a couple minutes and a pair of scissors later, it's perfect! I would recommend sizing up. I am typically a small, and I ordered a medium in this and I love the fit. 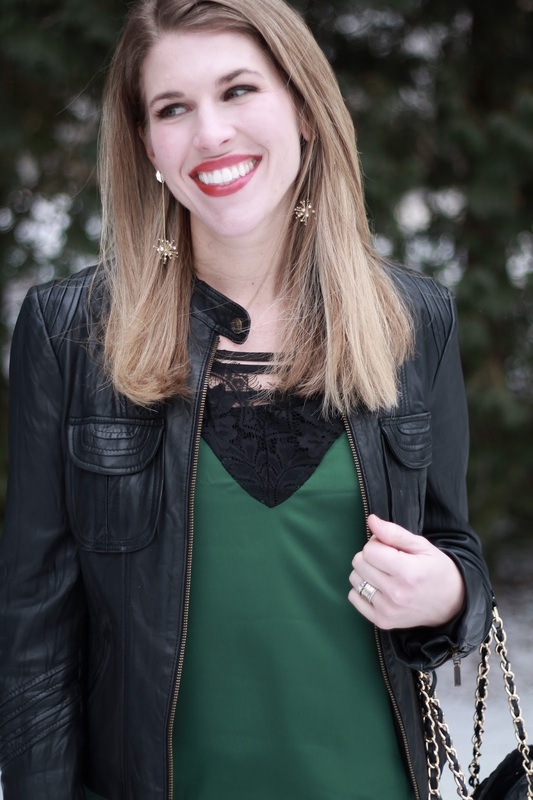 Detail at the neckline is trending right now and this camisole is a good way to try it at a low price point. With the lace and horizontal straps, there is no need for a necklace which makes accessorizing super easy! I would say this runs true to size. I ordered a medium, but should have gotten a small. I ended up taking it in on the sides a bit. I like your handbag! Nice outfit for sure! both look are so cute, I love the details in that little white dress. I love both of these pieces! You styled both looks perfectly. That dress is adorable and love the contrast of green and lace on the cami. Love both of these looks! That tunic is adorable with the pom poms and tassels! Both of these outfits are beautiful, Laura! Snipping off those tassels, is an easy fix, but I know sometimes I don't even think about doing those fixes!! Great thinking!! Love both of these pieces! That tunic with Pom poms is too cute! SheIn has such great quality pieces! Oh I LOVE that lace cami!! That's so pretty! I'm pretty sure I would have styled it exactly the same as you! Hope you had a great weekend! Two fantastic looks! I am really liking the lace cami you have on. I've been looking at the whole cami. trend but just don't feel like I can pull it off on top of another shirt, plus where I work people would just look at me funny. I really like how you styled it with the moto jacket, little edge with a touch of feminine lace. Perfect DIY on this tunic! Love both looks. That pom pom tunic is so much fun!! It's nice to add a few more wintery pieces right now to freshen things up! Loving both of those looks! You look adorable! You are so good at finding awesome pieces on SheIn's site! 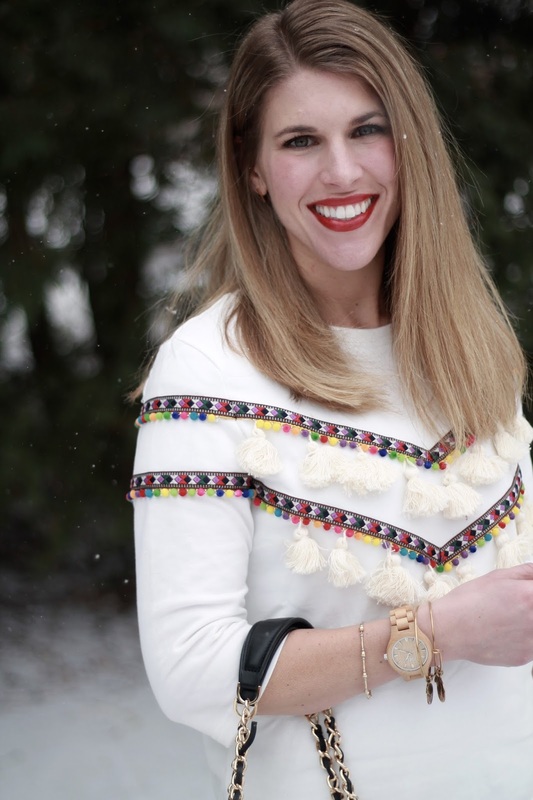 I love that you personalized the tunic by snipping off the pom poms around your shoulders! What a great idea! Oh my gosh, I love both of these pieces! The pom pom tunic is really fun and just adorable. I don't miss the extra tassels on the arms at all. love both looks laura! that green looks so good on you! The Pom Pom tunic is so cute!! And omg the KS earrings are amazing! You're making me need them!! That tunic is really nice. What a beautiful colors on the pompons.